As we are approaching the end of July, I’m realizing summer has edged past its’ full swing hitch. If we are to believe the well stocked aisles of school supplies already on display at the Walmarts and Targets around America, we are sidling up to the last hurrahs of summer vacation. Over the last few weeks I’ve read plenty of articles and blog posts on how to have great frugal fun with your kids this summer. I even listed some fun stuff to do to celebrate summer back as we all headed into summer on Memorial Day Weekend. This weekend , however, my five year old taught me an extremely valuable lesson. Knowing that my husband would be away for the weekend working in another town I asked my son if he wanted to do anything in particular this weekend as a special treat. He beamed and said “Mom, I want to stay home and PLAY!” I scratched my head a minute and tried again thinking he didn’t really understand what I as offering.”Do you want to go to the zoo? Maybe a bike ride? The Farmer’s Market again would be good…” (since I really did want to go back). And he said, “No, Mom. All I want is to stay home and play. With you.”. Well ok then, I thought. We can certainly do that. I was a little befuddled by this. Staying home and being together is kind of our regular thing. But I’d asked and had given him free reign on this choice so I was in the soup for whatever it was he asked for (within reason, of course, and this clearly was). So stay home we did. Over the course of our weekend, we did a little minor grocery shopping (Had to have milk, of course. And he wanted ice cream for our stay home weekend) but we mostly stayed in. Now, when I say stayed in, we really did. Between the July desert heat and then, later, the rain since we are now entering monsoon season here, we literally stayed in. We played Chutes and Ladders so many times I lost count (I only won once. And we play fair!). We wiggled and danced and stomped for hours playing Hullabaloo and laughed as my 18 month old would stand ever so proudly on the wrong color or shape (of course he’s too young to know colors and shapes yet-but he knows ‘nose’ and ‘feet’ and ‘head’ and ‘car’ and…ok, you get the picture). We baked cookies. We made popcorn and turned out all the lights and laid on the living room floor with pillows to watch Dumbo one evening. The next evening we’d decided we had so much fun the first movie night that we watched Ratatouille. We played airport and we played chase. We played Ranch with my son pulling out the Little People Farm along with his playhouse and pairing them to create a Ranch. I listened to the intricate story he was building around his creation. We built train tracks and chugged for miles. We opened the windows when the rain rolled through and marveled at the fierce sound of thunder and the incredible smell of rain in the desert. They helped me make dinners (and strangely they actually asked for broccoli-I’m a really lucky mom). Tonight while making dinner my son was playing in his play kitchen near my real one and was busily creating a restaurant. He was wearing his chef hat and apron and reading his “cookbooks” (which were really my dictionary and a few of my antique schoolbooks). He asked how to spell “spaghetti” and I realized he was making a menu. We talked about how much he should charge. $1 for the spaghetti. $2 extra for the “really good meatballs” (smart kid). He asked for an extra long bathtime to play and see just how prune-y they could get. Afterwards, we all cleaned up the toys together and settled things down. We were in pajamas and enjoying our homemade ice cream sundaes together around the table (he had even scooped the ice cream himself-mostly) and I asked him, “So, sweetie, what was your favorite thing about our weekend?” He looked at me and smiled an ice cream-sticky smile and said “You Mom.” I was stunned. I asked “Not making peanut butter cookies? Playing Ranch?” He said, “No. My favorite thing was being with YOU.” Like that was the easiest and clearest thing in the world. Because to him it was. There was no need of zoos, or trips anywhere, no need for high impact, quick moving, big dollar fun. No need to break the budget. He just wanted Me. Even when he has me all the time and everyday. I was stunned. I am humbled. We all tend to go looking to fill summer with zoom-pow-bang fun and activity. We look for advice on how to entertain our kids and families on a budget. But here’s the secret my five year old taught me because my five year old has it more right than I could have ever guessed: All they really need is us. With them. In their world. Front and center and present. Sometimes it’s just as simple as that. So next time you’re wondering what to do with the rest of summer, put down the list and take your kids’ hand. They will lead you where they need to go. All you have to do is follow. 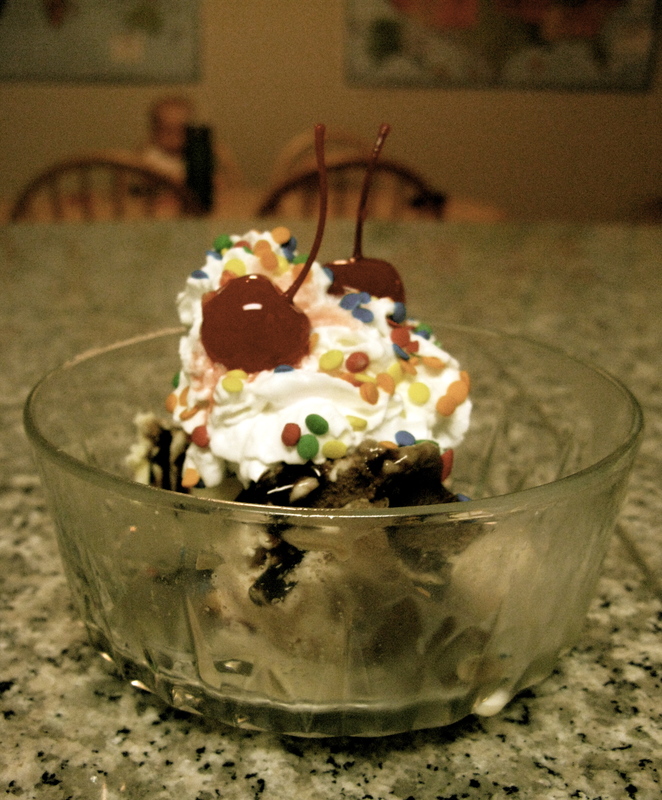 Masterpiece Sundae on Sunday night-with two cherries-just how my five year old wanted it. Posted in Practical Things and tagged budget, free entertainment, old fashioned fun, simple. Bookmark the permalink. AWESOME post! I too am learning this lesson with my 13 month old. I realized that if I give home more attention…more of me, during the day he actually behaves better AND sleeps better at night. I think it is the sense of “security” they need to feel. I need to remember to get off the computer & put down my phone more often!